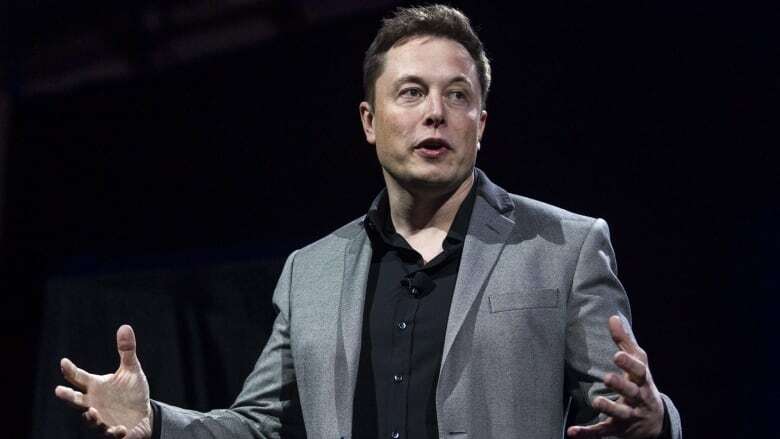 Chief executive Elon Musk said on Tuesday he is considering taking Tesla Inc. private in what would be the largest deal of its type, moving the electric car maker out of the glare of Wall Street as it goes through a period of rapid growth under tight financial constraints. Tesla shares jumped 11 per cent to close at $379.57 US, slightly below their all-time high. "Am considering taking Tesla private at $420. Funding secured," Musk said on Twitter. At $420 US per share, a deal would be worth $72 billion US overall. Musk did not disclose the source of the funding. In a letter to Tesla employees published on the company's blog, Musk explained that such a move - over which no final decision had been made - would let Tesla "operate at its best, free from as much distraction and short-term thinking as possible." Tesla shares closed up 11 per cent at $379.57 US, slightly below their all-time high. Asked on Twitter whether Musk would continue to be CEO under such a scenario, he replied there would be "no change." Musk has been under intense pressure this year to prove he can deliver on his promise to turn his money-losing company into a profitable higher-volume manufacturer, a goal that has propped up Tesla shares and resulted in a market value higher than that of General Motors Co. The Silicon Valley company faces a make-or-break moment in its eight-year history as a public company as competition from European automakers is poised to intensify with new electric vehicles from Audi and Jaguar, and more rivals to follow suit next year. The company is still working its way out of what Musk called "production hell" at its home factory in Fremont, California, where a series of manufacturing challenges delayed the ramp-up of production of its new Model 3 sedan, on which the company's profitability rests. Going private is one way to avoid close scrutiny by the public market as Musk and the company face those challenges. Musk has feuded publicly with regulators, critics, short sellers and reporters, and some analysts have suggested that less transparency would be welcomed by Musk. "Musk does not want to run a public company," said Gene Munster of Loup Ventures, as Tesla's ambitious mission makes it "difficult to accommodate investors' quarterly expectations." Musk owns nearly 20 per cent of the company. He said in his letter to employees that he did not seek to expand his ownership. A price of $420 US per share price would represent a nearly 23 per cent premium to Tesla's closing price on Monday, which gave the company a market value of about $58 billion US. "Our guess is there is a one-in-three chance he can actually pull this off and bring Tesla private," Munster said. "The 16 percent premium to the current share price may not be high enough to incentivize existing shareholders to support the sale." Musk tweeted that he hoped all current investors would remain were the company to go private. He made no mention in his tweets or his letter of where the funding for a deal would come from. If Musk succeed in taking Tesla private, it would be the largest leveraged buyout of all time, beating the record set by the $45 billion US deal for Texas power utility Energy Future Holdings, which ended in bankruptcy in 2014. Raising both the debt and equity required for such a deal would be a challenge. Many major Wall Street bankers contacted by Reuters said on condition of anonymity that they were not aware of Musk's plans ahead of his tweets, and several expressed skepticism that a leveraged buyout of Tesla could be financed given the company's negative cash flow. "It's unfathomable to me that anyone would finance the acquisition of such a liability-laden company that is losing so much money and have massive capex requirements going forward," said Mark Spiegel, portfolio manager of hedge fund Stanphyl Capital Partners, who holds a short position in Tesla and has been a vocal critic of Musk on Twitter. The most obvious equity partners for Musk would be a sovereign wealth fund such as Saudi Arabia's Public Investment Fund (PIF) or major technology investment funds such as SoftBank Group Corp.'s Vision Fund, bankers said. Such foreign sources of capital would be subject to scrutiny by the Committee on Foreign Investment in the United States (CFIUS), which looks closely at deals for potential national security risks. Earlier on Tuesday, a source familiar with the matter said Saudi Arabia's PIF had bought a minority stake of just below five per cent in Tesla. The U.S. Securities and Exchange Commission allows companies to use social media outlets like Facebook and Twitter to announce key information in compliance with its fair disclosure rules so long as investors have been alerted about which social media outlets will be used to disseminate such information. Despite the unconventional method of disclosing such information, analysts took Musk at his word. "I believe Tesla considers Tweets as public disclosure," said analyst Chaim Siegel from Elazar Advisors. "Plus this is short squeeze rocket fuel after a nice quarter." A short squeeze is a trading scenario that occurs from time to time in heavily shorted stocks, when bearish traders are forced to buy shares to avoid big losses - something that ends up pushing the stock only higher. Short interest in Tesla on Tuesday stood at nearly $13 billion US, according to S3 Partners, a financial analytics firm. In his letter to employees, Musk wrote that, "as the most shorted stock in the history of the stock market, being public means that there are large numbers of people who have the incentive to attack the company."